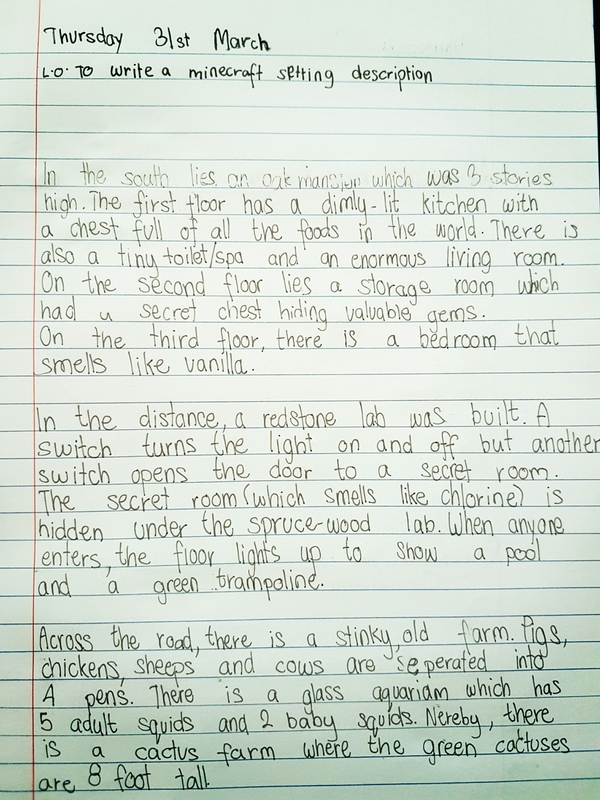 Descriptive writing of settings is one of my favourite areas to teach. I enjoy enthusing my students; trying to find ways to boost their creativity and imagination. *School visits to beautiful settings. *YouTube videos of amazing places. The Metamorphosis Of Narcissus, Salvador Dali. All of the above have meant the students have had to look at something and describe it. I was very interested to see if using Minecraft, in which the pupils have to create a setting from scratch, would have an impact on their writing. How Did I Set Up And Deliver The Lesson? First, the weekly home learning was to create a Minecraft world (I encouraged the children to be as creative as possible). Then I made Google Slides for the lesson (click here for access). In the lesson itself, the students spent 5 minutes recapping prepositions. I also had them pinned on my working wall. Then I gave them 5 minutes to show their world to a partner and explain what things are. After, I displayed one of the children’s worlds on the board using Apple TV to project the iPad screen. 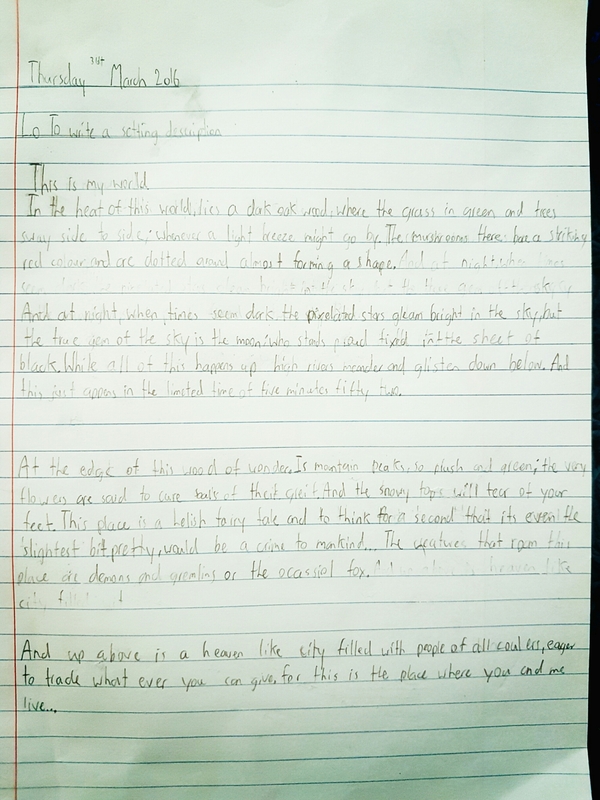 We did a shared write of the setting as a class. Finally, the student’s began writing their setting descriptions in their books (they were free to look at their worlds on their iPads – BUT NOT PLAY OR CREATE ANYTHING ELSE!). What was the outcome? Did Minecraft increase the level of description in their writing? In my opinion, the students were certainly motivated to write and the quantity of writing increased a great deal (especially in some of the boys who can be reluctant writers). 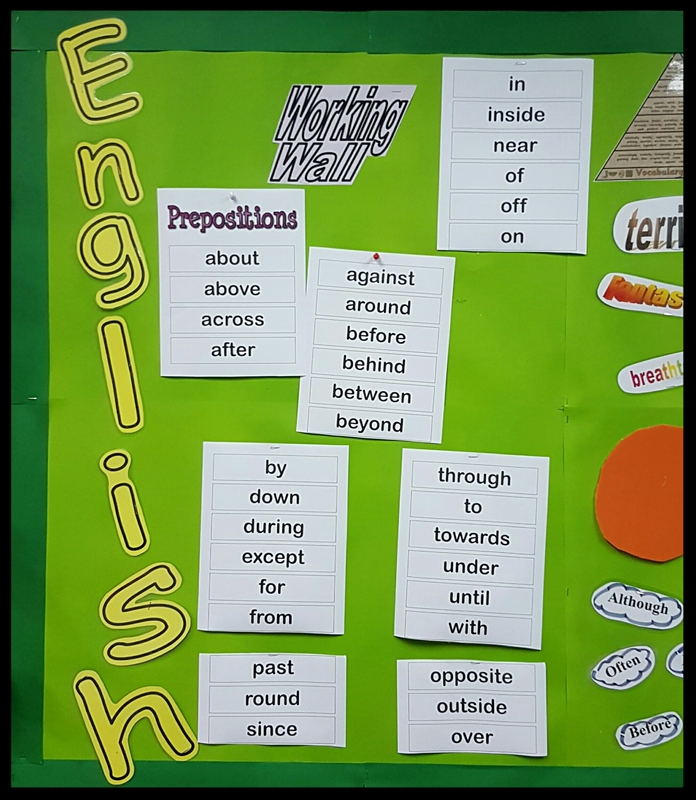 Interestingly, they used many prepositions and some children commented that it was easier to do so because they could look around and see clearly where features were in relation to other objects. In terms of the quality, I would have to say I found no improvement. The writing was on the whole quite literal; the students described exactly what they had built and they had thought less about the appearance, sounds, smells and feel of the setting. However, I have to point out, this was the student’s first go and I think that with more of a focus on the descriptive element of their worlds, Minecraft would be a success. Have you used Minecraft in this way? What other prompts do you use for teaching descriptions of settings? Let me know by commenting below. Previous Don’t Buy Expensive Sensors For Science Lessons! Here’s An Amazing Mobile Phone Hack. With the children being quite literal as per the last example, this gives you the perfect opportunity to edit and improve! Photocopy work and ask them to ‘drop in’ adjectives, similes, personification etc! It seems like you have the perfect skeleton to now add flesh too! Sorry for the gruesome metaphor! I have wanted to use Minecraft for a while. But the logistics of it have been difficult. The elementary has a Minecraft server, but we don’t have one set up for middle level. I have always thought building a Sumerian city state in grade 6 would be amazing. Can students show understanding of why they developed the way that they did by creating one in Minecraft? I also teach an online class for Genocide and Human Rights. I thought it would be cool for the kids to design a monument to a Genocide, then the students could create tour screencast highlighting the elements they included to represent what happened. Since very few of my online students had ever heard of Minecraft, I was afraid that the time to learn how to navigate Minecraft and the amount of money it would cost for the mobile app would limit their ability to complete the project. I will keep trying though. I think it has great potential. Really interesting ideas Kathleen. I’m lucky; all my students play Minecraft and are very skilled at it. They’re actually the one’s who teach me! 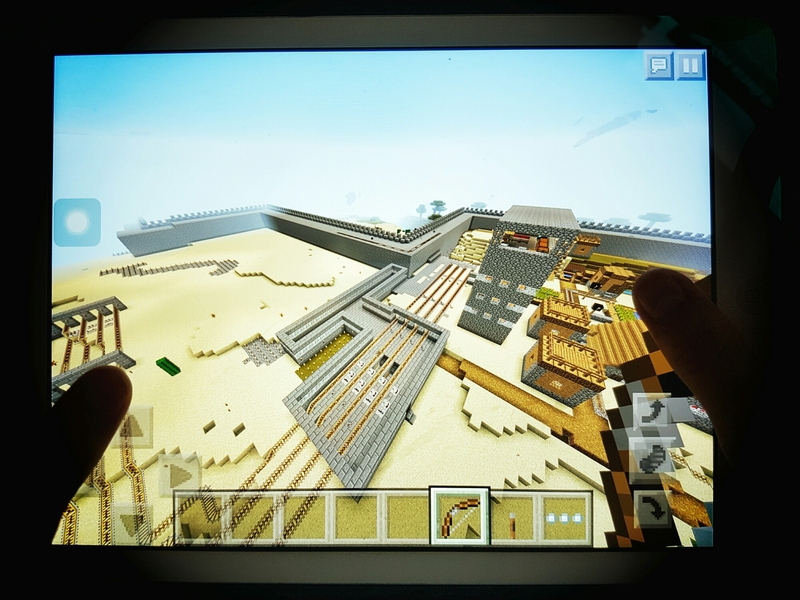 I have also made extensive use of Minecraft with EAL students and I agree with a lot of what you are saying here: the context of the world they have created provides a great backdrop for descriptive writing, but they also need guidance and encouragement to go beyond the literal and get more creative with their choice of words. For my students, the ability to revisit and add to their worlds while writing was a key part of the process. Just as they needed to plan, draft, reflect on and redraft their texts, they needed to do the same with their gameworlds. At times, a small dose of writer’s block could be overcome by making some adjustments to their creations. At others, their writing inspired them to go and change something in the game – a powerful moment and certainly one worth pursuing.